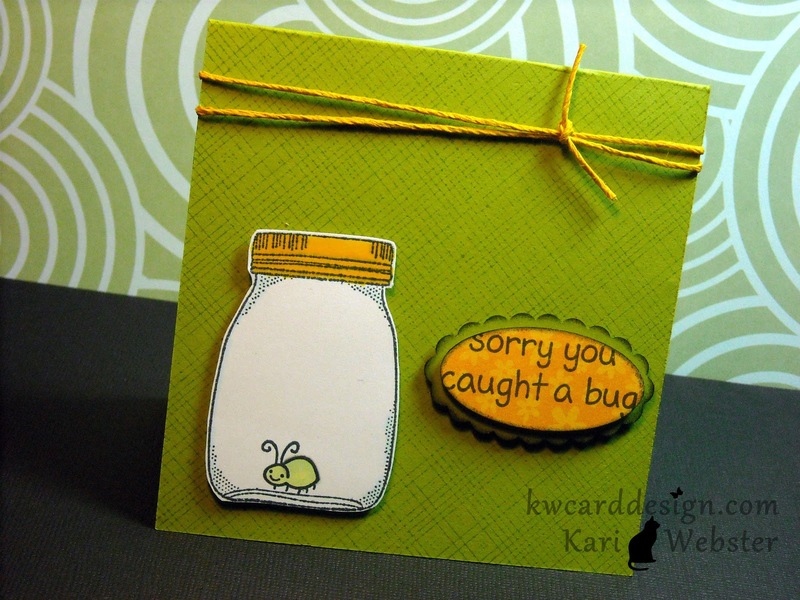 KWCardDesign : Feel better soon!! Hi all - I am here today to share with you a quick simple card I made using Lawn Fawn's set On the Mend. Allergy season is among us, and that means lots of colds, and "catching bugs" of all sorts. So - I thought it would be cute to take the approach of having lightning bugs in a jar to present " being sick with a bug". As you can see, I didn't do too much to this card - I wanted to keep it simple. I popped up my main image on dimensionals , and also my sentiment - and added some Lawn Fawn trim - or "Lawn Trimmings". It coordinated well with the yellows I had in the jar lid and of course the patterned paper as it is a piece of Lawn Fawn's Bright side 6 x 6 pad. Thought I would enter this card also into this week's Lawnscaping Challenge. Be back soon for another share! I can relate to battling allergies. This season is off to a rough start. Your card is adorable and sure to cheer up anyone battling allergies or any other ailment;) Have a happy anniversary, we celebrate ours on the 19th (by heading off to a cabin into some quiet rest for a few days). So cute! I love the color palette and the little bug in the jar, adorable!